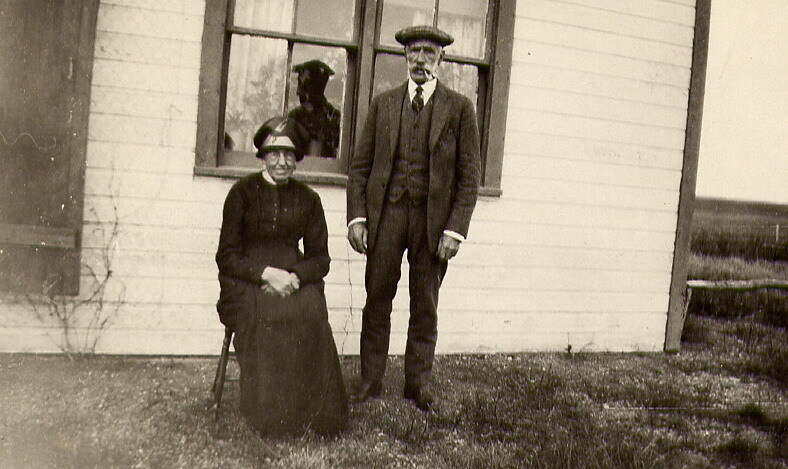 Janet WATSON and her husband Gilbert SPEIRS, Ellisboro, Sask. probably in the late 1930s. From the author’s collection. Janet SPEIRS (left) was born to Janet WATSON and her husband Gilbert SPEIRS (above), their only child. I have not been able to locate her birth registration in Scotland, however on her 1952 Saskatchewan death registration her daughter states her birth date was 22 December 1888. Scottish census records indicated that she was born either in Saltcoats, Ayrshire, Scotland (1891 census of Scotland), or Kingarth, Buteshire, Scotland (1901 census of Scotland). The 1911 census adds to the confusion as Janet, 22, listed her birth place as ‘Argylshire, Inellan’. Photo left: Janet Speirs, taken in Saskatchewan during WWII (see photos below). From the author’s collection. Whichever her place of birth, as child Janet moved often. In 1891, when she was 2, her father Gilbert, 33, was a shepherd and her mother Janet, 35, a housekeeper for a farmer named Mitchell, on Overton Farm, Killearn, Stirling. By 1901 Janet, 12, had moved again, this time to Rankinston Farm, Ayrshire. While Janet attended a local school, her father was a farm servant and her mother worked as a dairymaid at the farm. By this time Janet would certainly have known, and played with, her Watson and McConnell cousins, the children of her Uncle Tom and Aunt Jane [Thomas WATSON and Jane MUIR] and her Aunt Isabella and Uncle John [Isabella WATSON and John McCONNELL]. The extended Speirs-Watson-McConnell family experienced many changes in the early 1900s. In 1904 the sudden death of Janet’s Aunt Isabella McConnell left a family of young children motherless. Janet’s Uncle John McConnell, who had recently become unemployed, was not able to look after all the children by himself. Janet’s parents (Janet and Gilbert Speirs) were involved in helping the McConnell family cope. Janet, 16 in 1904, if not away from home working as a domestic servant, would have been called upon to help with the McConnell children. As other stories in this blog about the extended Speirs-Watson-McConnell family have explained, in the early part of the 1900s most of them immigrated to North America, particularly Saskatchewan. Janet also wanted to follow her Watson cousins, and shared this ambition with her cousin Nellie [my grandmother [Helen (Nell) McNab WATSON] in April 1910 had left Scotland with her parents [Thomas and Jane Watson], and four siblings. We know that Janet wanted to leave Scotland from a postcard she sent to Nellie. 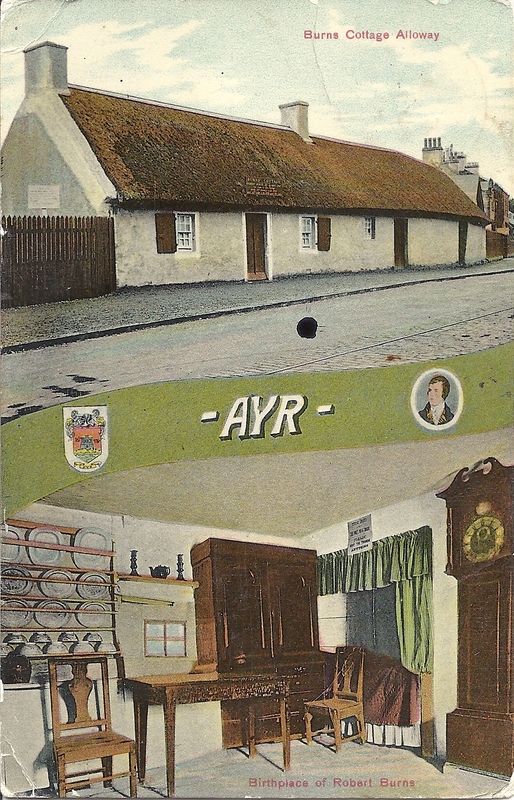 [* Girvan was where Janet’s cousin Mary Hunter Morton McCONNELL lived – see post 20 April 2013. Janet’s parents (Janet and Gilbert Speirs) may have also lived in the Girvan area in 1910]. It took just over two years for Janet to convince her mother, or for other family events to occur, that the move to Saskatchewan not only possible, but desirable for the Speirs family. On 2 November 1912, daughter Janet, 23, ‘domestic servant’, boarded the ship S.S. Cassandra in Glasgow. With Janet were her mother Janet, 54, and her father Gilbert, 57. Janet’s cousin Elizabeth Wyllie McCONNELL, 17, [see post 26 April 2013] also traveled with them. The group disembarked in Montreal, Quebec on the 12th of November, 1912. The ship’s passenger list showed that their destination was Wolseley, Saskatchewan. From Montreal, a train journey took the new immigrants to Wolseley, Saskatchewan, where no doubt they were met at the railway station by members of the Thomas and Jane Watson family. Christmas 1912 Janet would have been united with her Watson cousins and no doubt she and her cousin Nellie had many stories to share. Janet Speirs likely found work as quickly as she could, possibly as a ‘hired girl’ for one of the neighbours. She had been in Saskatchewan only about a year when, at 25 years of age, she married John (‘Jack’) INGLIS. They probably were married in Ellisboro, Sask. about 1913 as their daughter Janet [another Janet] was 2 years old in the 1916 census, i.e. she had been born about 1914. Photo right: John Inglis, taken in Saskatchewan during WWII (see photos below). From the author’s collection. Not much is known at this time about John Inglis or indeed about the Inglis family. The 1916 census listed John Inglis as 28 years old, which meant that he was the same age, or a year older, as his wife Janet. The census also recorded that he was: born in Scotland; Presbyterian; and worked as a labourer. The census also recorded that he immigrated to Canada in 1912, the same year as Janet. Would it be too much of a coincidence if John and Janet knew each other in Scotland? More research is required to find out which part of Scotland John came from. For a number of years Janet and John lived in Ellisboro, they then moved north a few miles to a farm known locally as the ‘Johnny Thompson Farm’. They rented this farm until John (‘Johnny’) Thompson married and needed the farm for himself and his bride. The Inglis family was required to move so the farm would be available to the owner. They lived for some time, once again, in Ellisboro and then bought land in the Abernethy – Balcarres area, just a few miles from Lemberg. We know that they had moved to Abernethy by February 1933 by The Wolseley News, Wednesday, 12 July 1933 account (see below) Also Janet (Inglis) nursed her mother Janet Speirs (d. 12 February 1935) there before her death. Janet’s father Gilbert also died (d. 19 April 1941) at the Inglis home. Above, death memorial card for Janet’s mother (Jennet) Watson / Speirs. The card, as well as the one below for Janet’s father Gilbert, was sent to Janet’s cousin William Watson McCONNELL in the United States [see post 28 April 2013]. These death memorial cards are still in the collection of William McConnell’s descendants Mary Smith who lived in Tennessee before her death. 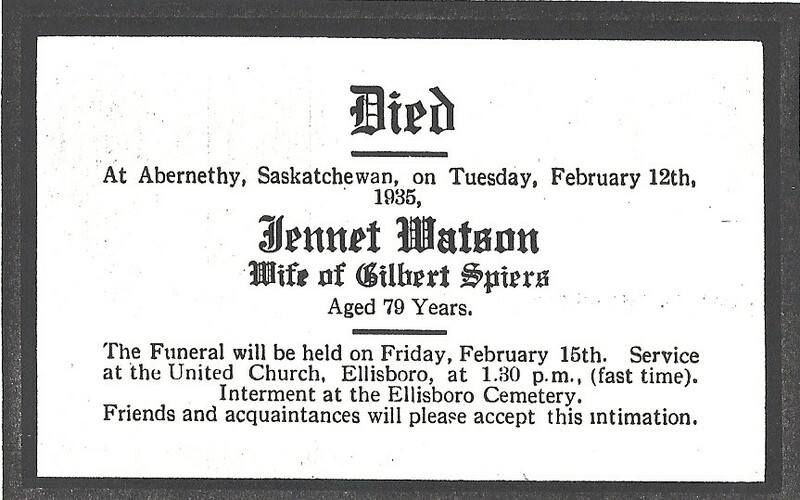 Janet Watson INGLIS, also known as Jennie, was born about 1914 (according to the 1916 census). She likely was born in Ellisboro. Very little is yet known of her life. She married after 12 July 1933. The Wolseley News, Wednesday, 12 July 1933, in the ‘Ellisboro news column’ noted that “Miss Jennie Inglis spent the weekend with her parents in the Abernethy district.” As Mrs. R. S. EICHEL [Ronald Sinclair EICHEL], of Indian Head, she was the informant of her mother’s death in 1952. There is a grave in the Indian Head, Saskatchewan cemetery with a similar name, and a death date of 1955 – perhaps this is Janet’s grave? Photo above right: Janet Watson Inglis, taken on the ‘Johnny Thompson Farm’, Saskatchewan, about 1930. From the author’s collection. John (‘Jack’) W. (Watson? William?) INGLIS was born in the first few months of 1916, according to the 1916 census. He also was likely born in Ellisboro. From the photos below we can surmise that he was in the Canadian Army in WWII, it is not known what he did after that. His grave is not with the rest of his family in Balcarres, Saskatchewan. Photo right: John W. Inglis, taken in Saskatchewan during WWII (see photos below). From the author’s collection. 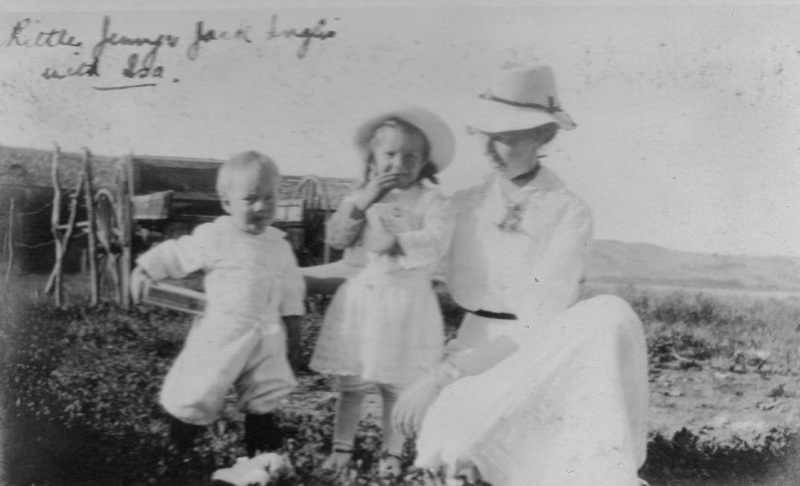 Photo left: “Little Jenny and Jack Inglis with Isa”, from the collection of M. W., Mauchline. 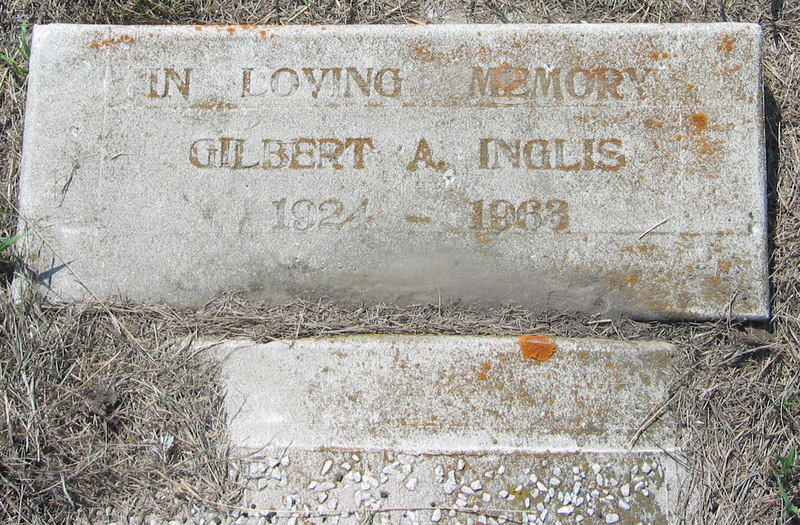 Gilbert A. INGLIS was born in 1924 and died in 1963; these dates have been obtained from his gravestone in Balcarres, Saskatchewan. Gilbert was probably born on the Johnny Thompson Farm. A family story indicates that, as a boy, Gilbert was a good racer and could ‘”run like the wind”. Photo right: Gilbert Inglis, taken on the Johnny Thompson Farm, Saskatchewan, about 1930. From the author’s collection. Photo above left: Gilbert’s grave taken by the author 13 July 2002, in Balcarres, Saskatchewan. Children numbers 4 and 5 were twins, J. (James?) Gordon INGLIS and Kenneth W. (William? Watson?) INGLIS. 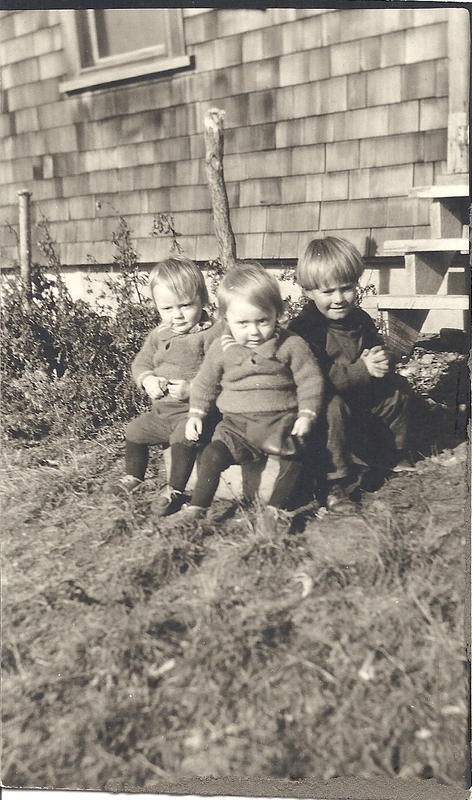 They were born on 1 May 1925, probably on the Johnny Thompson Farm. 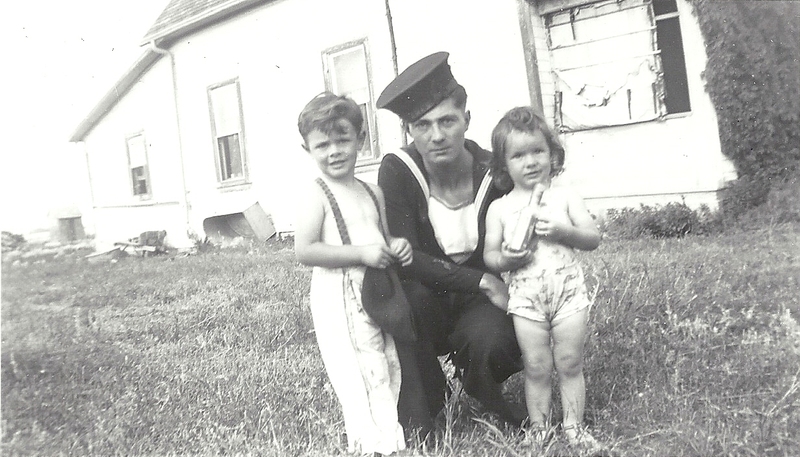 We know from photos that Kenneth was in the Canadian Navy during WWII. Kenneth died 25 March 1990. He is buried in the Balcarres Cemetery. 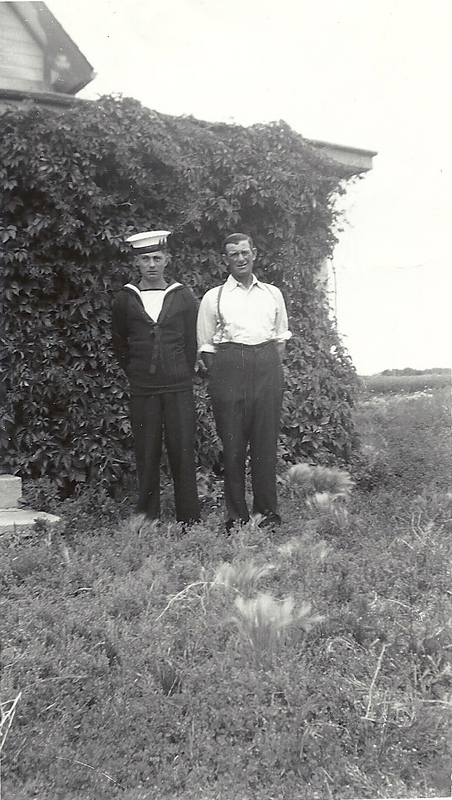 Photo above left: Kenneth W. Inglis, taken in Saskatchewan during WWII (see photos below). From the author’s collection. 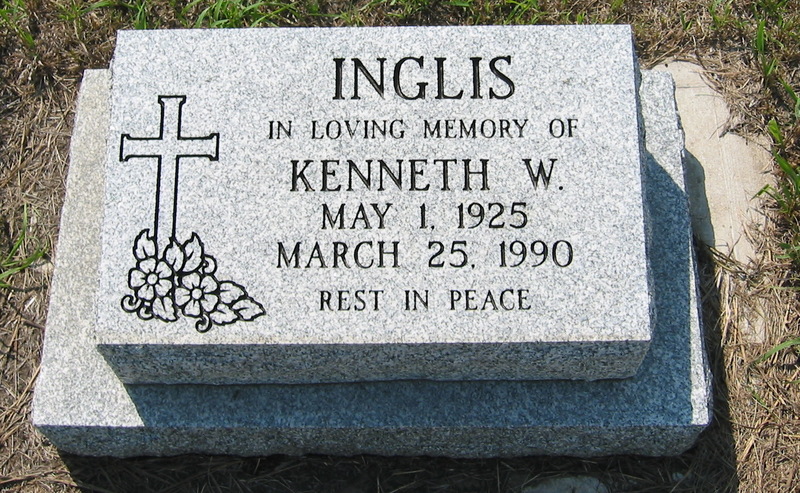 Photo above: grave of Kenneth W. Inglis, taken by the author 13 July 2002, in Balcarres, Saskatchewan. Nothing is known about Kenneth’s twin J. Gordon at this time. According to the information on his gravestone in Balcarres, he died 14 June 1993. 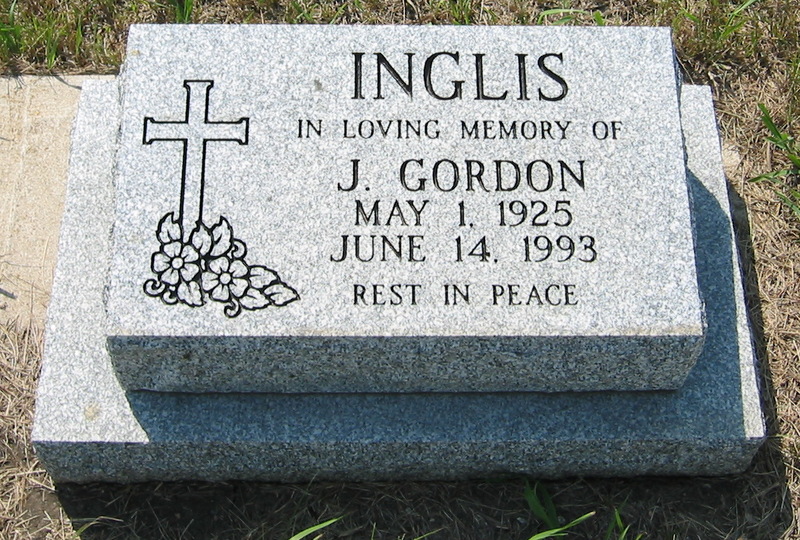 Photo right: grave of J. Gordon Inglis, taken by the author 13 July 2002, in Balcarres, Saskatchewan. 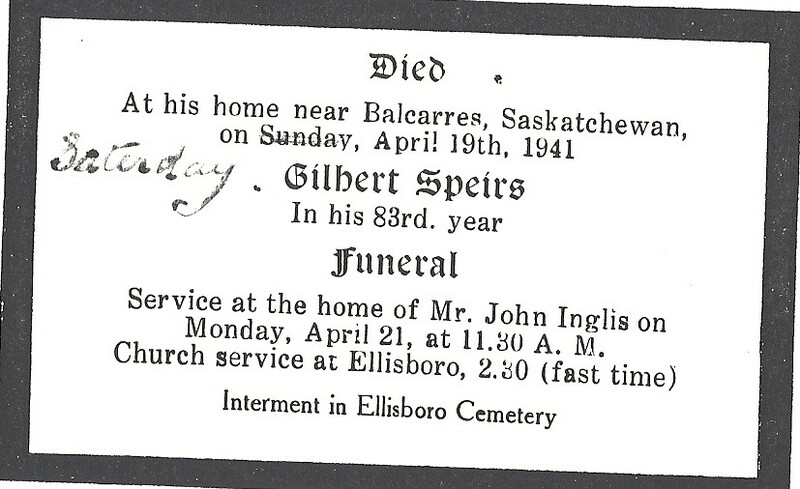 Information at this time is very sketchy about the Speirs-Inglis family. We do know that they kept in touch with the extended Watson – McConnell family. As well as shared photographs and postcards there were family visits. My mother remembers that even in the period 1950-1970s, and until my grandfather Joseph (Joe) ACTON died in 1972, John (Jack) Inglis would visit Joe in Lemberg. Jack would have been a ‘cousin-in-law’ to Joe; Joe’s wife Nellie [Helen McNab Watson] and John’s wife Janet Speirs had been first cousins. 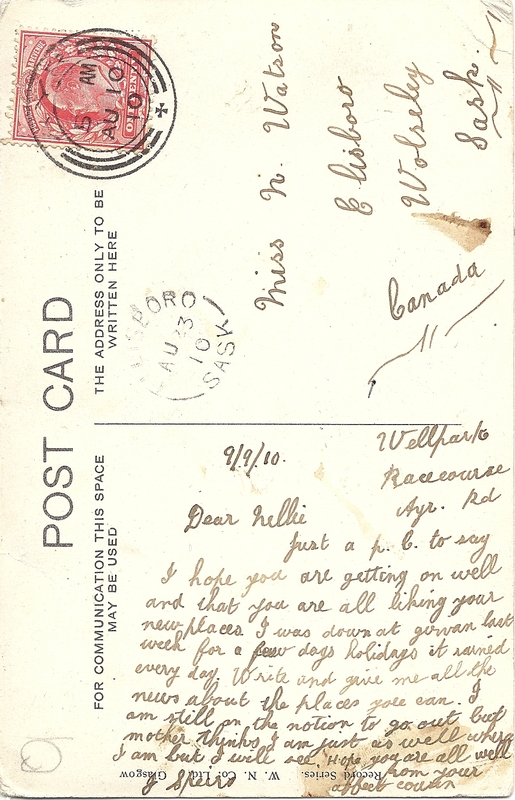 Nellie had been the recipient of Janet’s post card from Scotland, almost 50 years earlier, in 1910. Janet (Speirs) Inglis died 16 June 1952. According to the date on the grave in Balcarres her husband John Inglis died in 1980. 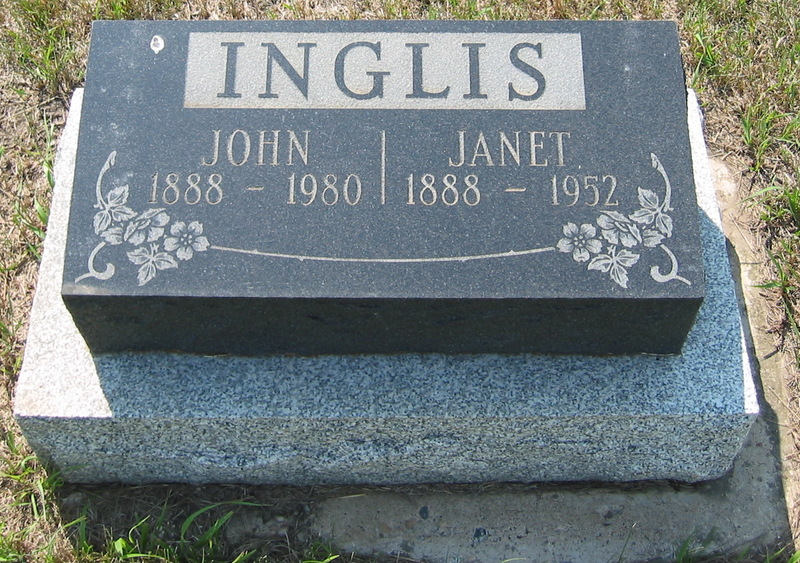 Photo right: grave of Janet and John Inglis, taken by the author 13 July 2002, in Balcarres, Saskatchewan. On back of photo right: Jack, Janet & young Jack’ Is this the Inglis farm home near Abernethy? From Jack’s army uniform this appears to have been taken during WWII. Perhaps Jack had just enlisted and received his uniform and was leaving home? On back of photo left: Ken Inglis & his dad. This photo was taken in the same location (although not the same day – Jack isn’t wearing a tie) as the photo above, sometime during WWII. Perhaps Ken had just received his uniform and was leaving home? On back of photo below: no names, but we know from the above photo that the man in uniform is Kenneth Inglis. Who are the children? 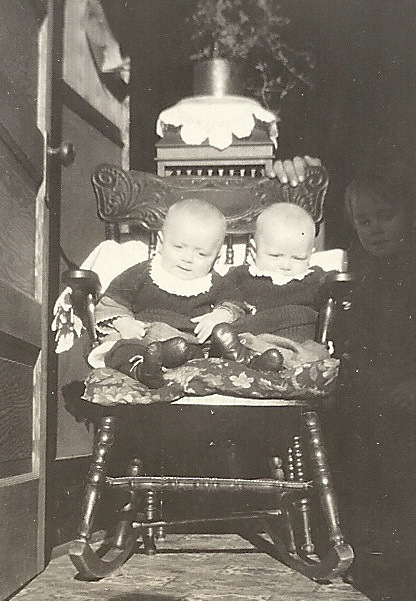 Could these be Ken’s nephew and niece, the children of his sister Janet Watson Inglis who had married Ronald Sinclair EICHEL? The children could be Keith EICHEL (b. abt. 1941) and Mae EICHEL (b. abt. 1943). The children’s sister Ruth EICHEL (b. abt 1942) had ‘died as an infant’ so this is not likely her. 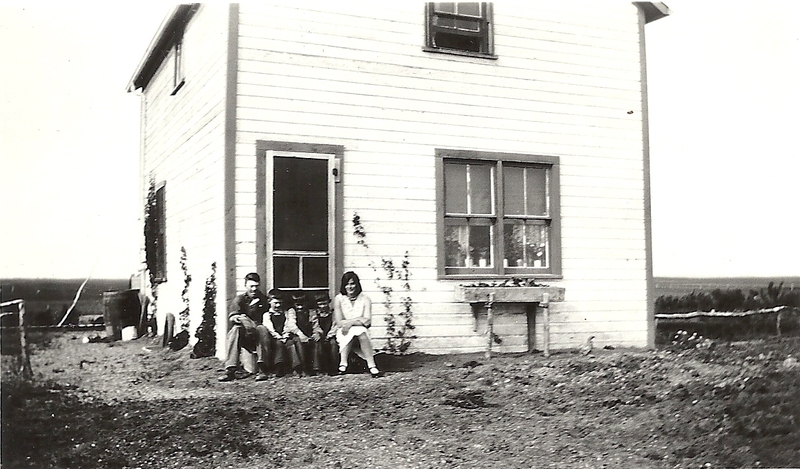 On back of photo right: Inglis Left to right in the photo could be: John (Jack) born about 1916, Gilbert, born 1924; twins – J. Gordon and Kenneth W. born 1 May 1925; and Janet Watson, born about 1914. The location is probably the ‘Johnny Thompson Farm’; surrounding countryside bleak. Photo taken about 1930? Photo left: Inglis twins Ken & Gordon Location – same as above photo. Taken probably in the summer of 1925 (the uncropped photo shows this photo is in the front doorway, during warm weather). Photo below: Unknown photo. Could these be the Inglis twins and ?. The photo format is a postcard that has been made in Canada so this is not a family from Scotland, although the provenance of the photo would indicate that this is a Watson family relation.